Bread Loaves, Breads and Desserts, Breakfast, Cuppylicious! Total time: 1 hour 10 minutes. Preheat the oven to 350 F. Butter a 4 x 8 loaf pan. Combine flour, salt, baking soda and baking powder, set aside. 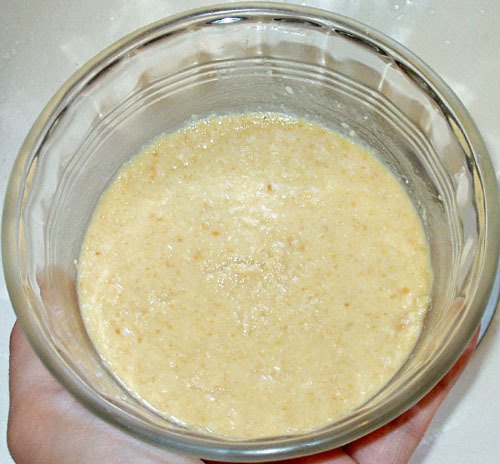 In a large bowl, mix together sugar, oil, mashed bananas, eggs and vanilla. Add flour mix and stir until just combined. If you’re including walnut pieces, fold them in now. Pour batter into loaf pan and bake for one hour. What worked for me last time was to bake it for 45 minutes on 350 and then drop the temperature to 300 for the last 15 minutes. It smelled burned, but I was unable to find any burned bits. 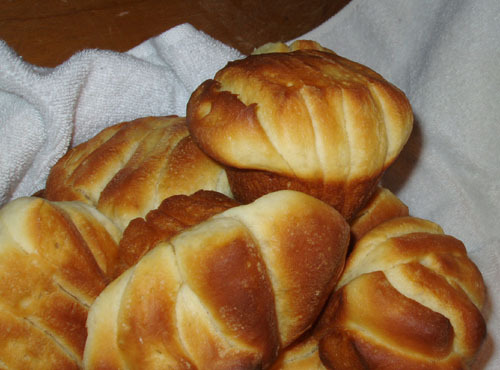 Adapted from Buttermilk Rolls in the Joy of Cooking. Makes 12-24, depending on how you want to rock it. Combine yogurt and milk, mix well. Spoon out 1/3 to 1/2 cup of milk mixture and heat to about 110 F. Stir well and often. Remove from heat and add yeast, stir well. Let set 3-5 minutes or until frothy. Stir yeast mix into original yogurt mix. Add baking soda, salt, and sugar, and mix well. Add 2 cups of flour and 2 T melted butter. Stir or mix until incorporated, then add remaining 2 cups of flour. Place dough in a greased bowl and cover (with a towel or greased saran wrap). Let rise until more than doubled in bulk, about 3 hours. Punch down dough and knead lightly in the bowl. Separate the dough into 2 parts. Roll each part into a square about 1/8 inch think. Let sit 2-3 minutes. Bake 15-20 minutes, in a preheated 425 F oven, until well browned. Most often when I make these, I only make 12 rolls, and the rolls look like stay-puffed marshmallows trying to fit into a thimble. They’re pretty epic, and sometimes they stick together completely, and I can just dump the whole pan upside down to get them out. Not for Dad. Serves 4-6. Wash potatoes well, remove sprouts and blemishes, and either peel or don’t peel them. Cut potatoes into bite size or larger cubes. Place potatoes in a large pot, and fill with water 2 inches higher than the highest potato. Cook covered or uncovered 20-40 minutes or until potatoes are tender. Drain well. Rinse potatoes with cool water, drain well, and refrigerate for 20-30 minutes. In a large mixing bowl, mix together mayonnaise, hard boiled egg yolks, celery, pickles, pickle juice, dijon mustard, dry mustard, salt, paprika, and optional salt & pepper to taste. Be sure to crush the egg yolks to make them smooth. It should taste on the salty side. 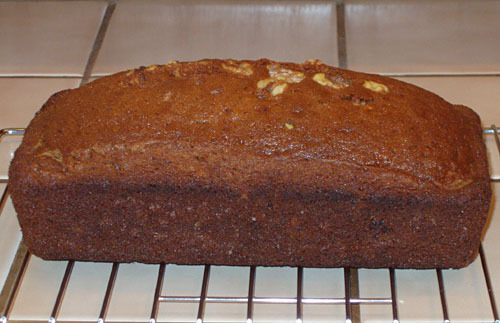 Refrigerate for 20-30 minutes. 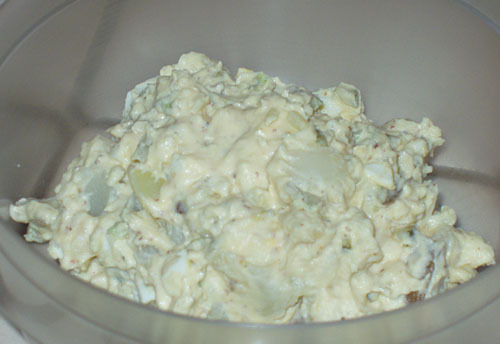 Add potato and egg pieces to the dressing and mix well. Chill for 20-30 minutes to let the flavors settle. If you’re wanting a picnic salad, you really shouldn’t use eggs. I use a full teaspoon of salt, plus 1/2 teaspoon of pepper, so that I don’t have to salt and pepper my salad on my plate. Most people will probably be fine with just 1/2 tsp of salt, though. Total time: Approximately 1 hour. The July 2010 Daring Cooks’ Challenge was hosted by Margie of More Please and Natashya of Living in the Kitchen with Puppies. They chose to challenge Daring Cooks to make their own nut butter from scratch, and use the nut butter in a savory recipe. The original recipe given called for chicken, I used beef, and I substituted heavy cream in place of milk. 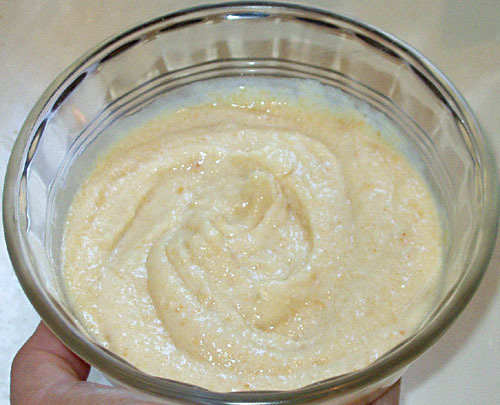 Mix together almond butter and heavy cream in a food processor or blender (or whisk until smooth). Set aside. Stir garam masala, ginger, cinnamon, and pepper together in a small bowl. Set aside. If desired, pound meat to ¼ inch (6 mm) thickness to promote even cooking. Sprinkle with a bit of salt and pepper to taste. Heat 1 teaspoon (5 ml) olive oil a large nonstick skillet over medium-high heat. Add half the meat; sauté 3 to 5 minutes on each side or until cooked through. Cook the meat in 2 batches, adding more oil if needed for second batch. Set aside on clean plate and keep warm. Melt the butter in large nonstick skillet over medium-low heat. Add the onion and cook gently for several minutes to infuse the butter with onion flavor. Keep the heat low to avoid burning the butter; a little color is fine. Add the spice blend and garlic and cook for 1 minute or till fragrant, stirring constantly. Add the tomato sauce, stir well, and bring to boil. Reduce heat to simmer. Whisk in almond cream until thoroughly combined with tomato sauce. Return to simmer. Add broth (or water) to sauce to reach desired consistency; return to simmer. Add more broth (or water) as needed to thin sauce as desired. Transfer sliced meat to sauce. Simmer gently for a few minutes until meat is heated through. 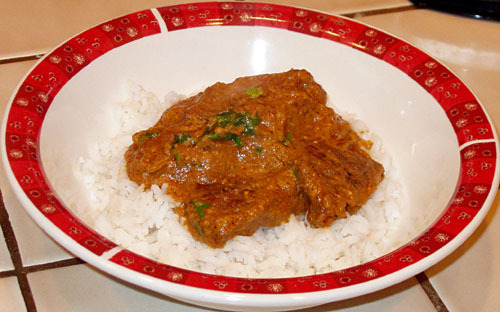 Serve meat and sauce over rice. Garnish with chopped parsley and/or sliced almonds if desired. As this is, I couldn’t possibly label it as Indian, but it definitely has an Indian flavor to it. So if you’re looking for something reminiscent of Indian food, and you’re not a fan of cumin or fenugreek, this is definitely a winner. 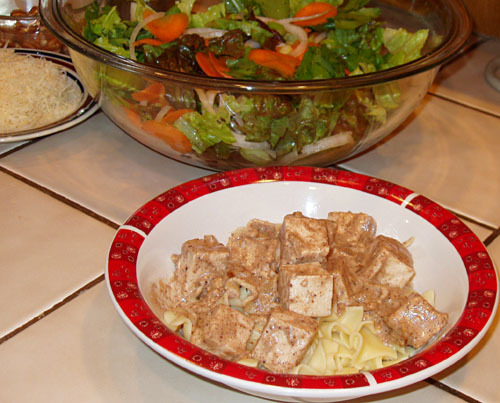 It looks like stroganoff with tofu, and it could be. Mix pecan butter and heavy cream in a food processor or blender (or whisk until smooth). Set aside. Heat the oil in a large saucepan over high heat. Cook the onion 2-3 minutes, stirring constantly, then lower the heat to medium-high until well browned (about 5 minutes). Add garlic and cook for one more minute. Add tofu and cook until most of the moisture is gone from the pan, and the tofu is brown on all sides (about 10 minutes). Add pecan cream and any herb seasonings, and bring just to a boil. Salt and pepper to taste. Serve over rice or noodles. Try it with meat instead of tofu. Add mushrooms, if you like (I don’t like). Pour nuts into bowl of food processor. Grind the nuts in the processor until they form a paste or butter. The nuts first turn into powdery or grainy bits, then start to clump and pull away from the side of the bowl, and finally form a paste or butter. The total time required depends on the fat and moisture content of the nuts; grinding time will vary from roughly 1 to 4 minutes (assuming a starting volume of 1 to 2 cups [240 to 480 ml] nuts). You may add oil as desired during grinding to make the nut butter smoother and creamier or to facilitate grinding. Add oil in small increments, by the teaspoon for oily nuts like cashews or by the tablespoon for dryer/harder nuts like almonds. You may use the corresponding nut oil or a neutral vegetable oil like canola. The inclusion of salt in the nut butters is optional and to taste. If you make nut butters from salted nuts, peanuts or cashews for example, you will not need additional salt. 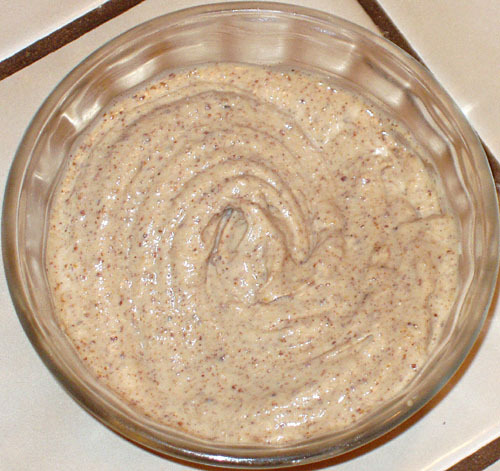 * To make your own nut butter, process in a food processor an amount of nuts equal to double what the recipe requires. In this case, I used 1.5 cups of salted, unshelled peanuts, and processed until a smooth paste formed. 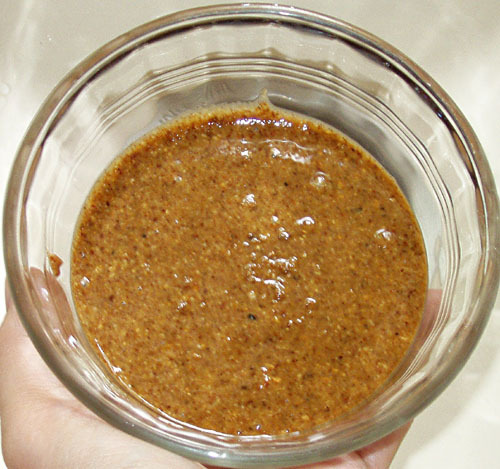 Some nut butter might require oil (to process and make smooth) and salt (to taste). This is a stirring-constantly stir fry. Heat oil in a large skillet on medium-high. Add onions (it should sizzle) and cook until clear or golden brown, 3-5 minutes. Add sliced beef and cook until brown on all sides, 2-3 minutes. Add curry paste and mix well until all pieces of meat are coated. Add carrots, coconut milk (remember to shake it before opening it! ), and peanut butter. Stir well. Add soy sauce and brown sugar, mix well, and cook until it just starts to boil. Cover and reduce heat to low, cooking until the carrots are tender or desired doneness, 5-10 minutes. If you like your carrots firm, skip the reduction. Add spinach and stir well until the spinach wilts and is completely covered in sauce. This is a little more sauce than there is food to coat, so if you have more vegetables, you should probably add them. 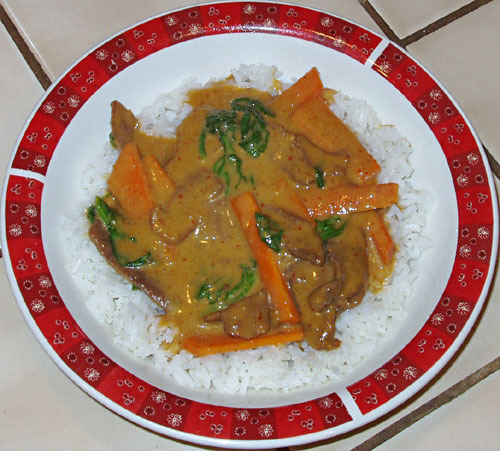 The flavor of your red curry paste will vary, so use caution if you don’t like a lot of heat. I never put seafood anything in my curry paste, and I always use the full amount of peppers, because you never know if you’ll get “lame duck” peppers instead of the good hot kind you really want. Alternatively, I hear this is really good with pre-made raspberry vinaigrette. 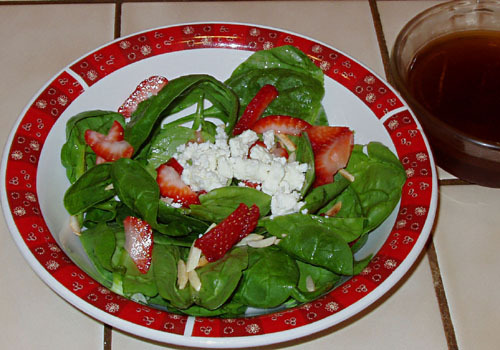 What a crisp, summer, fresh, wonderful salad! I mixed up the salad and then drizzled the dressing on top. I put a full 1/2 cup sugar in the dressing, but it was just way too sweet for me. Next time, I’ll chop it in half and add to taste. I’m glad I didn’t mix the dressing in with the salad… It makes 4 bowls of salad, but the dressing makes enough for 8-12 bowls, depending on how liberal you are with dressing. I’ll definitely adjust that for next time, too.